We last looked at a full data report for Kirby's Epic Yarn from data that was recorded on December 6, you can read that full report HERE. Since my last report, Kirby's Epic Yarn was released in Australia, and also in Europe. Also since the last report, Nintendo released a financial statement that showed Kirby's Epic Yarn had sold 1.38 million copies by the end of December 2010. Of the 1.38 million reported sold, approximately 900,000 of those units were sold "overseas", being North America. 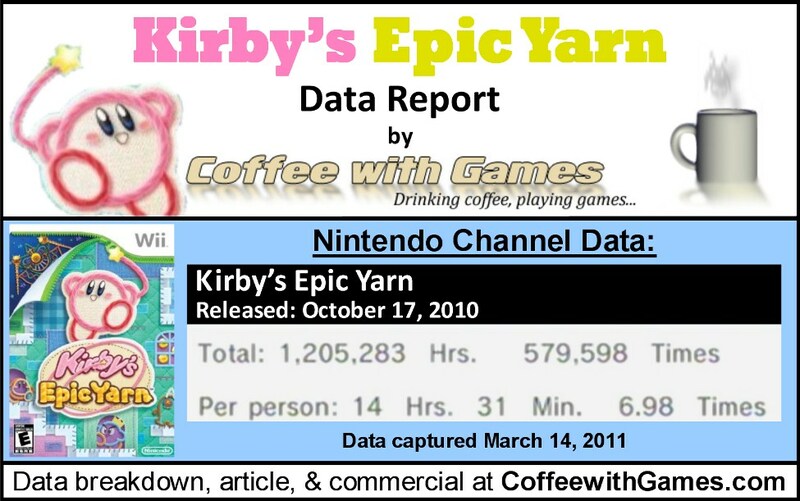 How many hours have Wii owners spent in Dream Land playing Kirby's Epic Yarn, with 149 days reported? Let's take a look! Kirby's Epic Yarn now has 83,036 Wii owners reporting their game-play data, through the Nintendo Channel. How many more players are reporting their play-time data for Kirby's Epic Yarn since the December 2010 report? Kirby's Epic Yarn has seen an increase of about 60,415 more players reporting game-play data, since December 6. Kirby's Epic Yarn now has 1,205,283 Total Hours of game-play reported, an increase of 921,945 Total Hours in the last 99 days reported. The average play-time for K.E.Y. is now 14 Hours 31 Minutes "Per person" reporting data, which is 1 Hour 59 Minutes higher than its average in the December report. Kirby's Epic Yarn's average play-time per session is just over 2 Hours 4 Minutes. Kirby's Epic Yarn's Amazon.com sale rank is #255, and is currently selling for $39.54. Kirby's Epic Yarn now has a "professional" review score average of 89.53%, based on 40 reviews on GameRankings.com. This is a slight increase of .08%, over what the "professional" review score average was for the game in early December. Kirby's Epic Yarn still has a 4.5 out of 5 Stars rating on Amazon.com, now based on 123 customer reviews. I still haven't played Kirby's Epic Yarn, but our neighbors purchased it and as of 2 weeks ago they were playing through it. I think we may do a trade, and exchange Donkey Kong Country Returns for Kirby's Epic Yarn, just for a little while(neighbors, if you read this, let me know if/when you want to trade!). I didn't recall hearing/seeing a commercial for Kirby's Epic Yarn, and when I searched for one when putting this post together, I found the video below as the only commercial for Kirby's Epic Yarn. If you didn't see the commercial, I think it's actually pretty good. After I watched it, I thought I remembered seeing it, but that would have been back in October probably when it was first uploaded. I'm not sure how long Nintendo ran that on television for the game, but I can definitely see that commercial catching a child's attention, and/or couples with children. As for the reported game-play hours, I think seeing Kirby's Epic Yarn already with more than a million "Total Hours" reported is really great for the game, especially when considering it released with so many other games during the holidays, and considering it doesn't even have online multi-player or leaderboards of any sort. Kirby's Epic Yarn was Kirby's first console outing since the N64, and with the game selling more than a million copies relatively quickly, I hope it encourages Nintendo to revisit past games, and explore new ideas with them like they did with Kirby's Epic Yarn. Have any of you played Kirby's Epic Yarn since my last report in early December? If so, what do you think of the game, good or bad? If you haven't played it, are you interested in playing the game? this is a game I picked up for my kids over Christmas. I love the look of it, but have only sat down with it for a short period of time (I enjoyed it though). my wife's commented on how she loves the graphics, but of my kids really only my youngest plays it. It's definitely on my relatively-soon-to-be-played list, just a few in front of it in line. Well, once you play it and beat it, I hope you share your thoughts on it...possibly with a review? I still haven't purchased this. I wanted to get it after playing through Donkey Kong Country Returns, but then we heard about the other Kirby game for Wii.... There's no way around it; I'm disappointed that Epic Yarn is easy to the point that people complain about that, so I guess I'm not eager to buy it before we hear more about that other Kirby game. My neighbor that owns Kirby's Epic Yarn, described the way you get hit in the game, as "Think of it like Sonic, when Sonic gets hit, he loses the rings, but you can gather some back." He did say the game is definitely easy, and I think for younger gamers, or soon to be gamers(like my son), Kirby's Epic Yarn would be a great place to start them off. As for the new Kirby game, I was actually hoping they uploaded the trailer for it to the Nintendo Channel, and I kept checking for it, because I was going to included it in this post. Thanks for the comment and feedback! If anybody else has any thoughts on Kirby's Epic Yarn, feel free to add to the conversation.